Reserve Alone at Last Today! My wife and I celebrated our 30th wedding anniversary this past weekend. The cabin is an A+ in our opinion. We really enjoyed the weekend with the music box, pool table and hot tub all right there with easy access. We would definitely recommend this cabin to others. We loved the cabin! Only downfall is the scary driveway. Washer and dryer need some attention. Jetted tub in bedroom didn't work. Our 2nd time staying at the cabin and we love it even more. So quiet and peaceful. Perfect for relaxing, especially on a cold night whether you're in the hot tub or cuddling by the fire. The steep driveway is a bit annoying but it isn't a deal breaker at all, and isn't impossible to maneuver into. Wifi is pretty strong and reliable as well but I prefer to unplug and enjoy nature when I'm there. I look forward to coming back to Alone At Last! The staff at the front desk was very accomodating and helpful. They took time to address my needs. Check out was easy as well. We loved the property and management staff, however, the extremely steep driveway was not mentioned and is not visible in any of the pictures. During the winter months (when we visited), this could be of concern. We cut our trip a day short due to winter storm warnings and our concern that we could not make it up the driveway. Otherwise our stay was very pleasant. Loved the cabin. Driveway is difficult and dangerous. Wonderful cabin but because of the driveway you might want to look at a different one. Requiring people to up load pictures of their Identification and credit credit card on line is very poor judgement on your part. I will not use your express service or recommend it to anyone else. My husband and I booked Alone at Last for our first getaway in a long time without our kids to celebrate our 20th Anniversary. This was our first trip to this area, our first time booking a cabin instead of a hotel, and we weren't sure what to expect. The express check in was super easy especially since we were going to be arriving late. The drive up to the cabin in the dark was a little scary and the drive wasn't marked well. We found the address for the cabin next door but ours wasn't listed on the drive. We ended up turning around a couple of time in trying to find it. The driveway is super steep and we were super glad that we had an all-wheel drive vehicle and that it didn't rain or snow. After the first few times, it wasn't an issue. The cabin itself was amazing! The pictures on the site do not do this cabin justice. It's super homey, warm and inviting! While traveling, my husband and I have rarely found a bed as comfortable as our own but this bed was as good if not better than ours! We did not use the hot tub due to it being a little chilly outside but it was warm when we checked it. Sitting on the deck after the day's activities was relaxing being able to enjoy the clear sky and bright evening stars. We did not have any issues that we needed assistance with. Thank you to the owners of this cabin for sharing this wonderful place with us! This is our fave cabin by far. We've been booking with CabinsUSA since 2016 and have no plans to change that. This cabin was perfect for just the two of us. The open spacious living room space with the pool table and the jukebox was my favorite. I loved that the master suite was downstairs and private, yet also spacious. Loved having 2 bathrooms because my husband and I both take long showers and we didn't have to wait for the other to finish. Not to mention the hot tub which was perfect for late night relaxation as we talked about our itinerary for the next day. The driveway was a bit of a hassle at first but it wasn't impossible to get in and out of. I loved how private and secluded the cabin is despite another cabin being on the same block. You can't see it from this cabin once you're inside or even on the back deck. I really hope this cabin is available for our trip next year! Express check in makes the whole process a breeze! Loved the cabin and the location, except for the parking space. Getting into parking space is not an issue getting out is pretty stressful. May not be a lot that can be done because of the location but other than that, a couple wanting a mountain get away couldn’t ask for any better. Very nice cabin loved it!! Relaxing and very nice!!! Can't wait to go back!!! The cabin was beautiful, we did require service for the fireplace, won't turn on. The maintenance guy came out very quickly and fixed it he was very friendly and even made sure hot tub was working properly. The driveway is quite scary going down to cabin, and the road up needs work. All in all we had a wonderful time, and would definitely recommend your cabins to friends and family. The cabin was very clean! Loved the cabin! Very clean, organized and plenty to keep busy! the only drawback is the property driveway. it is too steep and there is no alerts in our welcome package. I almost turnaround when first saw it. Late at night makes almost impossible to maneuver. If safety of your guests it is one of your values you should have alerted us ahead time. This cabin is amazing. Our first night we got an overnight snowfall and the view with snow on the trees was almost like we were in a snow globe. Even with the snow, the driveway to get up was clear and we were able to drive just fine. We were already planning our next stay with CaninsUSA while we were on this getaway!! Can’t wait to come back! Instructions to get to the cabin were more complicated than necessary and the driveway is super steep and scary but the cabin is beautiful, comfy and the amenities were superb. Big comfy bed, large tv's, nice pool table and the jukebox is great. Will definitely stay there again. Beautiful cabin. Best vacation we have had in a long time. Could use some new blankets and towels. Kitchen cabinets felt sticky (dirty) floor needs a good cleaning. My feet were black. Overall we enjoyed how secluded and beautiful the cabin is. Enjoyed playing pool and relaxing in the hot tub. The mattress was so comfortable, we slept so good. The access to, and the angle of the driveway was the most negative aspects. Upon arrival, we discovered the upstairs commode was not functioning. There was no answer when I called a couple of times to report it. Later in the evening (while we were at dinner) I received a return call and the next day it was repaired. Going up and down stairs to use a restroom that first night was somewhat of an inconvenience for a couple in their mid-60's. Apart from the driveway, we loved the location and amenities. We would definitely recommend your company, but, perhaps a different location. This cabin was an excellent choice for us. We wanted to get away for a while with no noise, telephones, etc. This certainly was the place. There were two things that kind of made the stay uncomfortable. The mattress needs to be replaced. It was very lumpy and uncomfortable. The biggest issue though was the couch. It is so broken down that the cushions sink into the pull out bed when you sit on it. Makes it very difficult to sit and enjoy a conversation or watch TV. The only other comment we might make is that the wood boaring bees on both porches made it almost impossible to enjoy sitting on the porches unless you wanted to be covered in saw dust. I don't know if there is any way of treating the boards they are boaring in but it might help. They are doing a lot of damage. Thank you for taking the time to let us know about your recent stay in Alone at Last! We here at Cabins USA work hard to ensure our guests have the same great stay. Thank you for your suggestions. Your comments have been forwarded to our Owner Liaisons and they will be bringing this to the owner's attention. When you are ready to stay with us again, please mention you are a return guest for an additional discount. Thank you for choosing Cabins USA and we look forward to seeing you again! I truly enjoyed the view. The driveway gave me anxiety the entire time however the inside and amenities made up for it. I loved the seclusion and it was very romantic. I never got to use the hot tub because on our last day we did not have cold water. I called but no one came before check out so we had to take a cold shower before hitting the road. Thank you for taking the time to let us know about your recent stay in Alone at Last! We here at Cabins USA work hard to make sure each of our guests have the best stay possible while vacationing in the Smokies. I apologize for the issues you experienced with the water. I am happy to report that maintenance was able to correct that issue. When you are ready to stay with us again, please mention you are a return guest for an additional discount. Thank you again for your review and thank you for choosing Cabins USA! We originally was booked in a different cabin but due to some issues with that cabin , cabins USA allowed us to stay at Alone at last and I am so glad they did !!! From the moment we walked in we felt at home. The cabin was spotless. The furniture was very nice even tho the couch could have been a little more comfortable. All of the amenities were very nice. View was great , especially from the hot tub !! The driveway was as everyone has said ... a little challenging but the cabin is so worth it !!! It rained every day but 2 out of the 5 days we were there but the cabin was so nice that we actually enjoyed just staying in. Definitely would love to go back one day !!! I am so happy to hear that you enjoyed your stay in Alone at Last! We here at Cabins USA work hard to make sure each of our guests have the best stay possible while vacationing in the Smokies. When you are ready to stay with us again, please mention you are a return guest for an additional discount. Thank you again for your review and we look forward to having you as our guest again soon! I am so happy that you enjoyed your stay in Alone at Last. When you are ready to stay with us again, please mention you are a return guest for an additional discount. Thank you for choosing Cabins USA and we look forward to having you as our guest again! Beautiful cabin. We had a fabulous time. Want to come back next year. Great time as always . Hate to see vacation end when we are in Tennessee . Looking forward to next year . Thank you for all of your kind words! We here at Cabins USA strive to give each of our guests the same great stay you enjoyed while vacationing in the Smokies. When you are ready to stay with us again, please mention you are a return guest for an additional discount. Thank you again for your review and thank you for choosing Cabins USA! We had the best time staying at this cabin. We were celebrating our 25th wedding anniversary. Very cozy, & very romantic. We enjoyed all of the amenities. Great place for that second honeymoon. Thank you for choosing Cabins USA to celebrate this special event in your lives! We work hard to make sure each of our guests have the same great stay you enjoyed while vacationing in the Smokies. When you are ready to stay with us again, please mention you are a return guest for an additional discount. Thank you for choosing Cabins USA and we look forward to hearing from you! Alone at last was nice, clean and comfortable.. A little far from the parkway but cozy. Would definitely stay again though.. Thank you for taking the time to let us know about your recent stay in Alone at Last! We here at Cabins USA work hard to make sure each of our guests have the same great stay you enjoyed while vacationing in the Smokies. When you are ready to stay with us again, please mention you are a return guest for an additional discount. Thank you again for your review and thank you for choosing Cabins USA! Everything we needed was right there. There were a few ants in the cabin but not overwhelming. The people were friendly and the surrounding area was full of activity. Thank you for taking the time to let us know about your recent stay in Alone at Last! We here at Cabins USA work hard to make sure each of our guests have the best stay possible while vacationing in the Smokies. Thank you for letting us know about the ants in the cabin. Maintenance has been notified and will be addressing that issue. When you are ready to stay with us again, please mention you are a return guest for an additional discount. Thank you again for your review and thank you for choosing Cabins USA! We REALLY enjoyed our stay here! We will be back! The cabin was just as wonderful as it was in 2004 when we honeymooned there. The addition of board games was nice! The only things worth pointing out are that the bedsheets are very low quality and rough feeling, and we didn't know if the carpenter bee problem had been brought up by other customers. The bees didn't bother us but it does look like they're doing damage to the exterior beams on the porch! All in all we loved our stay and appreciated the option to check in ahead of time so that we could go straight to the cabin. Our key code was a little late in arriving but the email arrived before we got to the cabin so it wasn't an issue, could be for some folks who arrive on time! Thank you for taking the time to let us know about your recent stay in Alone at Last! We here at Cabins USA work hard to make sure each of our guests have the best stay possible while vacationing in the Smokies. Thank you for letting us know about the carpenter bees. Maintenance has been notified and will be working to correcting that problem. When you are ready to stay with us again, please mention you are a return guest for an additional discount. Thank you for choosing Cabins USA and we look forward to having you as our guest again! My wife and I decided we were going to celebrate our birthdays by exploring a new city. When we arrived it was defiantly an adventure. getting up there was an adventure and pulling into the driveway was the hardest part. i didn't know if our car would fit or even if we got it down the hill, that it would come back up. however, once we arrived at Alone at Last. IT WAS AMAZING! the decor was amazing and we loved to play pool. The only thing we did not like was the shower downstairs. it was kinda dirty and moldy looking. We would totally would come back though. We loved everything about this rental except there were bugs everywhere, on the counters, stove, etc. other than that, we loved our stay! Cabin was very nice, clean upon arrival. Did check-in online which was nice, did not have to go to main office for directions etc. Driveway is hard to get in and out of but knew that prior to arrival. Bed was comfortable. Everything in the cabin seemed to work except for the fireplace in the bedroom which we did not need to use anyway due to warm weather. Plenty of hot water, my husband and I could shower at the same time with no issues. The only issue we had was we were surrounded by dogs who barked a lot, night and day. I would definitely rent this cabin again and have used Cabins USA several times in the past with no issues. Thank you for all of your kind words! We here at Cabins USA work hard to make sure each of our guests have the same great stay you enjoyed while vacationing in the Smokies. Thank you for continuing to choose Cabins USA and we look forward to having you as our guest again soon! Cabin was awesome! Just like being home. Driveway was difficult to get in....we were on a full size crew cab Silverado so we had to go past the driveway to turn around then go back past the driveway again then back down to the cabin. After a few time it wasn't bad once I got use to it. If you're gonna be coming in after dark it's a good idea to leave porch light on and that helps a lot to see and back in. If you stay in the summer time and you're real hot natured the thermostat has been locked so it will not go below 70°. It was warm for Christmas and my wife got warm and it wouldn't go below 70. I know you guys do that so it will not freeze up in the summertime because it will just continue to run if turned down to low. I do HVAC and that a nuisance call lol. No big deal tho.....overall we would definitely stay at Alone At Last again. Cabins USA is the only way to go to rent a cabin. We've been using them for the last 4 years and no prices a better! Thank you for all of your kind words and thank you for continuing to choose Cabins USA! We work hard to make sure that each of our guests have the same wonderful stay you enjoyed year-after-year. Thank you again for choosing Cabins USA and we look forward to having you as our guest again! The toilet continuously ran. The downstairs was chilly. The hot tub temperature was great. The cabin was very clean. We enjoyed ourselves and will probably go back. I am so happy to hear that you enjoyed staying in Alone at Last! We here at Cabins USA work hard to make sure that each of our guests have the same great experience you enjoyed while vacationing in the Smokies. Thank you for letting us know about the toilet and the temperature downstairs. These have been forwarded to our maintenance department and we will make sure they are both addressed. When you are ready to stay with us again, please mention you are a return guest for an additional discount. Thank you again for your review and thank you for choosing Cabins USA! This was the first time using Cabins USA and it was by far the very best rental. The process was wonderfully easy and the staff was great. The cabin was perfect. We absolutely loved it. If I could have a cabin of my own I would want this one. It was a beautiful cabin, all wood, decorated perfectly and not over done. Some can have too many knick knacks. The living room fireplace was perfect and so pretty and the hot tube was clean and worked well other than a couple of jets that didn't work and that was no problem and to be expected. The cabin was extremely clean. Who ever does the cleaning is to be commended as it was in great shape. Better than most we have stayed in. It was well stocked with everything we needed except for a starter pack of coffee. I wish I had known it had a Keurig as I would have brought coffee from home for it. But I had regular coffee and filters so again it was no problem. The only things that I would recommend be done is the jacuzzi needs a good bleaching and the jets need to be cleaned with q-tips as they were black and black flakes rolled when we turned on the water. We didn't use it since I had not brought bleach. Also, the vent underneath the bar needs a good cleaning. The downstairs shower door needs a good toothbrush cleaning on the outside down at the bottom. Neither of these things were bothersome and are not everyday cleaning issues. I am just a clean freak but it really did not bother us in any way. We had a great time and hated to leave. We could have easily stayed a week in this cabin. My husband is usually ready to head home but he said he could have stayed several more days as sitting out on the deck was so relaxing and made you forget any problems or things you might have to do. I certainly plan on coming back and really look forward to doing so. We live in the Blue Ridge Mountains and the drive way was steep but not a problem. My compliments to the owners, the housekeepers, maintenance staff and a big thank you to Cabins USA. Our 36th Anniversary was great. Thank you for all of your kind words! We here at Cabins USA work hard to make sure that each of our guests have the same great stay you enjoyed while staying with us. When you are ready to stay with us again, please mention you are a return guest for an additional discount. Thank you again for your review and thank you for choosing Cabins USA! Beautiful cabin. Very well kept. Very clean. Hot tub was very relaxing on the deck. Sunlight looked gorgeous coming through windows in the living room. Directions given to us were very easy to follow. The driveway is alil intimidating; but we decided to pull in the driveway every night so there would have more lighting in the daytime to back out of the driveway. Check out was done via text message; which was so convenient. I appreciated the reply to our text, this helped easy my anxiety on if the message went through. Staff was very helpful. We enjoyed our stay so much that we decided to extend out stay by another day; luckily our cabin was available that night. Will definitely be booking again through Cabin USA. This cabin was absolutely perfect for our honeymoon!! It was the perfect location, in between Pigeon Forge and Gatlinburg. The cabin was very clean and cozy. No other words to describe it other than perfect. Thank you so much for taking the time to let us know about your recent stay in Alone at Last! We here at Cabins USA work hard to make sure that each of our guests have the same great stay you experienced while vacationing in the Smokies. When you are ready to stay with us again, please let our reservationists know you are a return guest for an additional discount. Thank you again for your review and we look forward to having you as our guest again! This was our 2nd time staying at Alone Alone at Last, we enjoy this cabin very much. However, both porches were a little dirty. The hot tub water was questionable! And the driveway is a steep challenge. But over all the cabin is very enjoyable and relaxing. Thank you for choosing Cabins USA again! We always work hard to make sure our guests have the best stay possible. Thank you for letting us know about the porches. This has been forwarded on to our housekeeping department so that can be addressed. Thank you again for your review and we look forward to having you as our guest again! everything was perfect. the only thing negative we have to say is about the pool table. might sound dumb but the deciding factor on our cabin choice was a pool table. the one in our cabin was in need of some repair. the side rails needed repairing. there was no bounce. and the sticks were all warped. lost a little undercarriage on our car on the driveway. but other than that it couldn't have been any better. we look forward to coming back the same time next year if the pool table is fixed. thank you some much for a wonderful week. I am so happy to hear that you enjoyed your stay in Alone at Last! When you're ready to make your next reservations, please make sure that you let our reservationists know that you are a return guest for an additional discount. We look forward to having you as our guest again! Beautiful cabin and view. Will definitely recommend to our friends and family. Easy to get to Dollywood, Pigeon Forge and Gatlinburg. The driveway was adventurous :). I am happy to hear that you enjoyed Alone at Last. With over 300 cabins on our program, we're sure to have to the perfect cabin for your next trip to our area. Thank you for your kind review and we look forward to having you as our guest again! Thank you for taking the time to let us know about your recent stay in Alone at Last. We here at Cabins USA work hard to make sure that each of our guests have the same great stay that you did. Thank you for letting us know about the pool table and we will look into correcting that issue. Thank you again for your review and we look forward to having you as our guest again! Very beautiful cabin and view was gorgeous. Very clean and comfortable. However there could have been more sign to indicate location of cabin and driveway is a little risky to back down. I am so happy to hear that you enjoyed your stay in Alone at Last. With over 300 cabins on our program, we're sure to have the perfect cabin for your next trip to our area. I apologize for the issues with the driveway. I will forward your review on to our reservationists so they can make future guests aware. Thank you for your review and we look forward to having you as our guest again! I'd like to start by saying for a 1 bedroom cabin, it was huge! And beautiful! Not much of a view though. Yes, the driveway was rough. The first 2 nights we backed down about 50 yards. Note: go down front ways and pass the cabin and turn around in the circle. Then you only have to back down about 10-15 yards at most. The cabin was secluded but in a neighborhood where every evening we heard the dogs down the way barking. Had to close the doors. Bed was comfy cozy. The Internet jukebox was absolutely fun! Shower was amazing! We wouldn't go out or come back at night because the road was a little rough. But we left at 3 am and did fine getting down and made it safely home. Loved loved loved the cabin! The cabin was awesome. My only real complaint is that I drove to one office and had to back track to the other when checking in. They should really be more clear about which office the check in at. Like others have said, back down the driveway. Thank you for your review. We apologize for the inconvenience. We do provide our address to our check-in office on every confirmation that is immediately sent to our guest once the deposit has been processed. Our check-in office is located in Pigeon Forge right next to the Titanic museum. Again, we apologize for any confusion, and we hope that we will see you again soon. After I posted pictures on Facebook, I had several people message me for information. Hopefully some of them will call or book online. This was a great cabin with lots of room. The roads to the cabin were very washed out and extremely bumpy. We will probably rent this cabin again. It wasn't too far out but far enough. Loved loved loved this cabin!! We will be back! For someone who's used to flat ground the drive the first time was a bit much and the driveway isn't horrible but it is tricky! The pool table needs a little work along with the sticks but was still fun to play! I would recommend to bring your own dishwasher soap, bring charcoal, towels, and dish towels. So peaceful and relaxing I just cannot wait to visit again! Was very hard to find, hot tub could have been a little hotter but other then that enjoyed the cabin & will be back soon! Thank you for choosing Cabins USA. We are delighted that you enjoyed your stay with us at Alone at Last. We appreciate your feedback on your stay, and we look forward to seeing you again soon. Do not forget to call and ask about our return guest discount. The place was great. I would recommend you writing to Google Map and tell them to map out the property to the street. I personally did it when Google had my house wrong. It took months but they did thank me and changed it on the map. The driveway was very steep. The kitchen faucet leaked when on. The back door and front door needs painting. The back upper windows needs cleaning on the outside. Everything else was beautiful! Nicely decorated very charming. stayed for our honeymoon, wish we would have stayed longer. very nice inside, be careful backing in the drive! We had a wonderful and relaxing week in this beautiful cabin. It was very private and had a pretty view. The bed was very comfy as was the furniture. We spent a lot of time playing pool and enjoying the hot tub. We got to see it snow on the last afternoon...it was awesome! The driveway is super steep...you have been warned! Had a fantastic time. The cabin was beautiful, clean and everything was in working order. The cabin was beautiful! Everything was exactly how it was described in the ad! The only thing about this cabin was that the last mile to the cabin the roads were challenging, and of course the driveway was a bit concerning. I would recommend telling future customers that you need to pass the cabin, use the circle area to turn around, then back down the driveway. We found the circle area by mistake. It would have been helpful to have this information before we arrived. I would highly recommend finding the cabin during the daylight for your first time there. Again, I want to say that the cabin was beautiful! It was everything we expected! We had a few minor issues that we brought to the attention of Cabin USA. They offered to come to the cabin to remedy the situation but they were not anything we could not live with. I would highly recommend Cabin USA to friends and family! Thank you for your review. We are delighted that you had a great stay with us at Alone at Last. We apologize for any inconvenience that you may have encountered during you stay. We appreciate your feedback, and we look forward to seeing you again soon. Do not forget about our return guest discount. The house itself was beautiful, no complaints about it at all. The road to get there however is deteriorating and needs fixed, bad, not sure we could've made it if we were in a low car. The driveway was a bit steep and pulling or even backing in was a real challenge, not much turn around space at all. The area and view wasn't bad but there was a close resident that had dogs who liked to bark a lot at all.hours of the day and night. Kind of makes it bad when you go there for the peace and quiet. Deck rails were very loose and really needs tightened before they break and someone falls through. We have dealt with CabinsUSA twice this year and have had nothing but good experiences. We will continue to use this company for our Smokey Mountain Vacations. They have had great customer service each time. The cabin was great. The driveway was definitely a little nerve racking but we had read the reviews on the cabin and were prepared. I had e-mailed CabinsUSA for a referral on a private cabin located in the mountains. This cabin delivered on both requests. My only negative comment has to do with the shower in the master bedroom. There is mold starting to grow in the corners and ceiling of the shower which is a little disturbing. The shower heads need cleaned to help with the water pressure. Thank you for taking the time to write your review. We appreciate all your business and are delighted we are always able to provide you with great stays in the Smokies. We apologize if you were inconvenienced at all regarding the shower. We did have it looked into immediately, and it is not mold it is actually a stain in the caulking. We are having it cleaned this week. We appreciate all your feedback and we look forward to hearing from you again soon for you next Smoky Mountain vacation. We had a great time. The drive way is a little steep and I would recommend backing in, but that is to be expected when the cabin is on the side of a mountain. We will definitely be back! I would recommend this cabin and company to anyone! Had a wonderful and relaxing time! CabinsUSA provided a much needed get away at a great price. Will definitely use ya'll again. NOTE: Driveway is VERY steep and highly recommend BACKING DOWN instead of pulling in. Gorgeous cabin, absolutely loved everything about it! Reviews don't lie about the driveway, it is a little sketchy backing into. Otherwise, everything was amazing and I will be back! The cabin alone at last was wonderful. The only problem was the drive way its very hard to get out. The only problem we had wasnt with the cabin itself but one of the employees we called just after checking in and told them that our fireplace hadnt been lit yet and she said she would put in a work order well that was around 4:30 we waited and never heard anything called back same employee said it would be a little bit because they were short staffed which was around 630 than come 9 we still were waiting and called back and the same employee then said that maintance had went home for the night and wouldnt be there til sometime the next day so we then called the gatlinburg office and spoke with Danielle and she said she seen where we put the order in and she had them out to the cabin within 30 mins. They other girl was very rude. Other than that one employee by the name Drew and fireplace situation the stay at the cabin was wonderful. Great cabin great stay. We arrived in mid-September. The area was beautiful and we had a nice view with privacy. Thankfully my husband is an awesome driver/backer. We definately were on the side of the mountain and it was tricky getting to our location and backing into our drive. We never tried it after dark! The cabin was all and more than we expected. Everything that we needed was there and in tip-top condition. The cabin was clean, even in the corners....We had a little problem w/the smart tv, we called, they sent someone over with-in an hour. The hot tub wasn't quite hot enough, so my husband called, someone came over. We definately would go back, hopefully with some of our family, so we would need a larger cabin, however, if by ourselves, we surely would consider "Alone At Last". Cabin was great, but very steep driveway (not shown on internet). Road has a ton of potholes to get to the cabin. Very poor condition of road and driveway is why the lower rating. The cabin is miles away from everything so a lot of driving, nothing is close by. The cabin itself is has a lot of room. We had a wonderful vacation staying at this cabin. The road to get there is a bit tricky but not too bad. It's definitely worth it for the private location. Even though there are a couple of other cabins near by I would say this is quite private. The size and cleanliness were top notch. The check in/out process couldn't be easier. We are already planning a return trip next spring and would for sure recommend this cabin and agency. so far best cabin i have stayed in , everthing was great play on coming back soon CABINS USA IS THE BEST !!! The main issue we had was with the beds. They were not comfortable mattresses at all and sleep is definitely one of the main necessities of a vacation. This was a beautiful cabin! It was the perfect blend of rustic chic in decor and spectacular mountain architecture. Vaulted ceilings and big windows let in tons of sunlight from dusk til dawn. The view from both upper and lower deck were wonderful with trees and mountains in the distance! This cabin is high up and secluded from all other cabins except one next door but the layout of the cabin gives 100% privacy from the neighbors. The open layout of the entry floor was great for cooking while watching movies or playing pool. The hot tub was wonderful after long days of hiking. The Jacuzzi tub and king bed in the bedroom were also a big plus. All the furniture was comfortable and we couldn't have had a better 3 night get-a-way! I highly recommend this cabin. I have stayed in other Cabins USA properties and have always had GREAT experiences! This cabin was top notch. I loved the shower! It was huge! The hot tub and jacuzzi were very nice as well. I loved it and will probably stay here again next year, if it's available. It was decorated nicely, and made us very comfortable. If I HAD to pick something I would change, it would be the mattress cover on the bed. It made the bed a little too warm. The driveway was steep but my very low car got in and out just fine. You will not regret a stay in this cabin, it's wonderful! The cabin was great, we loved it. The driveway was a little difficult to navigate even with an SUV, but we will be back for our anniversary. cd player skips & all floors need to be cleaned with something besides broom i can send you my socks to show you. bedroom blinds do not work all strings broken, my sweetheart cleaned the whirlpool so we could use it, mold on faucets and control. shower hose loose. dont use the shower for two without flip flops unless you like mold. bed spread was use by previous couple, if you know what i mean, ooo..
so much dust on the moose in the bath room i thought at first it was a bear.speaking of moose who thinks that is a good idea for decor in Tn. Thank you for your recent stay in our cabin Alone At Last. We do apologize for the issues you encountered during your stay. These issues have been handed to our housekeeping and maintenance manager. We have already scheduled a deep clean for the cabin o ensure that all housekeeping issues will be taken care of. As far as the fireplace goes, the only reason is we do not turn those on until the first or second week of October. All cabin rental places have certain times they turn fireplaces on. We do apologize for any inconvenience this caused you. We hope to have you back with us again soon. Thank you for choosing Cabins USA. The cabin was great for a 2 day getaway. 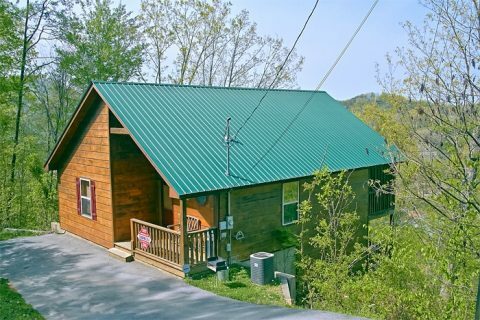 Not too far from both Pigeon Forge and Gatlinburg but far enough to feel like a secluded cabin. The drive up was fun, but for some may be a little nerve racking. You definitely need to back down the driveway, would not be an easy task to back out of it back onto the road. Overall great cabin, clean, well maintained and a great value! Would definitely stay again.